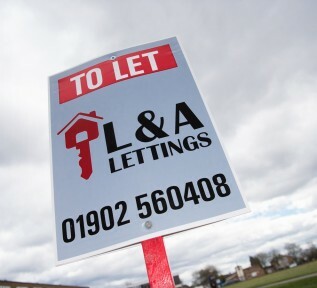 L & A Lettings offer a ‘Let Only’ service for landlords who wish to manage their own properties but need us to source a tenant, in the Willenhall, Wedsnesfield and Wolverhampton areas. Many landlords simply do not have the time or experience to organise numerous viewings for their rental properties or have problems finding the right tenant and may find it uncomfortable rejecting or vetting tenant applications. Our lettings agents will work with you closely to find and manage the right tenant for you, but you have the option to customise the service you provide in terms of maintenance and general landlord duties. We recommend this service for the more experienced and seasoned landlord who is able to maintain their own relationships with their own tenants, collect rent on time and manage any day to day issues which may happen whilst letting. As part of our ‘Let Only’ service we have a variety of methods to market your rental property in many ways which combines both online and traditional methods, this ensures we can source you a tenant quickly. Our experienced team of agents will advise you through our Let Only processes, of which comprises of services such as conducting property viewings arounds the tenants availability, including evenings and weekends where required. The initial rent collection service often helps the landlord to set everything up and helps relieve some of the stresses often associated with renting out a property. By the time you take over the property after we have placed the tenant all the vetting and referencing would have been completed making it easy for the landlord. We charge the equivalent to one month’s rental + VAT (minimum £600.00) for our Let Only service and there are a number of ways you can pay this. If you require assistance with any of the above, contact us today. Here is a more detailed list of the services included in our Let Only package. Following our extensive and thorough vetting process, (INTERVIEWS CONDUCTED IN POTENTIAL TENANTS CURRENT HOME), we will draw up legally binding tenancy agreements, and assist with any Housing Benefit Applications. We will then obtain a suitable, agreed deposit and forward to the Landlord, whose responsibilities in relation to the protection of the deposit will be explained and assistance provided to protect, if required. A full property inventory will be completed and supplied with a full set of property photos. A comprehensive package will be completed for the landlord including, credit check results, property meter readings, inventory, tenants identification documents, tenancy agreement and copies of all paper work included etc. For more information or for any questions you may have, please do not hesistate to contact us today or call us directly on (01902) 560 408.